You can use PayPal as a guest, an account is not necessary (It is safe and secure). The PayPal buttons connect you directly to checkout. I can also email a PayPal invoice if you prefer. I also accept checks and money orders, but this obviously delays shipping. Shipping is done 6 days a week, USPS only. 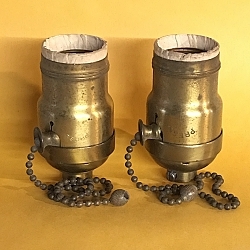 Pair of Bryant pull-chain sockets. Solid brass shell, cap, and chain with Deco ball finial. Both sockets have UNO threads. 1/8 IP thread in cap. New insulators. Fat-Boy size. Brass has worn, lacquered finish. Pulls work smoothly with positive contacts. Well used. $45.00 including shipping lower 48. #2 Arrow pull-chain socket, pre 1915 Fat-Boy with Hubbell 2-1/4 inch fitter (original rosette fitter screws). 9 inch chain with Deco ball finial, 1/8 IP cap, new insulators. Well worn lacquered finish in solid brass. Very strong pull and connections. $29.00 including shipping lower 48. #3 Hubbell pull chain socket, pre 1915 with Hubbell 2-1/4 inch fotter (original rosette fitter screws). This is the classic design with The Harvey Hubbell logo and fixed horn. 9 inch chain with solid acorn finial. 1/8 IP cap, original insulators and mica. Well used lacquered finish on solid brass. Strong pull with positive connections. $98.00 shipping included lower 48. #4 Paiste turn key socket in excellent condition. Post 1915 Fat Boy size in solid brass with UNO thread. Original insulators, 1/8 IP cap, conposite key. Strong action and connections. Perfect for bridge style floor lamps. Worn lacquer on polished brass. #5 Hubbell pre 1915 fat-boy pull chain socket with 9 inch chain and acorn finial. No UNO thread. Hubbell globe logo, 1/8 IP cap. There is a small split in the shell, and the lacquered finish is well worn. Still has a strong pull and excellent contacts. Original insulators in good conditon. $29.00 includes shipping lower 48. #6 General Electric intermediate turn-knob socket in excellent condition. Nickel plated brass in near perfect condition. Strong turn action and positive condition. Original insulator is a bit worn but still has a lot of life left. 1/8 IP cap with set screw. Interior is made of ceramic and copper. Very hard to find little socket. $27.00 including shipping lower 48. #7 The holy grail of sockets: Hubbell pre 1915 pull chain socket with 6-3/4 inch chain and cast acorn finial. No splits in the metal, original insulators in great condition, still has a strong pull and connections, and the mica center is still intact. This is an excellent candidate for a Tiffany restoration. Worn brass finish is ripe for Verdi-Gris application. Harvey-Hubbell logo. 1/8 IP cap, all screws original. $95.00 includes shipping lower 48. #8 Bryant Tournier style turn key socket in an Edison Patents shell. Well worn brass finish, but mechanically the socket is excellent. No mica in center. Nice early piece to work with. 1/8 IP cap. #9 Set of three P&S pull chain sockets, electrollier size(narrow), 8 inch chain with ball finial. Worn, lacquered brass finish, but no cracks at all. Strong pulls with positive contacts. New insulators. 1/8IP cap trhreads, UNO threads on shells. $53 including shipping lower 48. #10 General Electric turn key socket in an Edison Patents shell, mica center. Brass, with worn, lacquered finish. No cracks. The socket still has very strong connections. New insulator. 1/8 IP cap. Very nice early piece. $32.00 shipping included lower 48. #11 General Electric socket in an Edison Patents shell, mica center. Solid brass with worn finish, no cracks in the metal. Very strong connections, new insulator, 1/8 IP cap. Very early socket. No UNO thread. #12 Set of three P&S narrow pull chain sockets in excellent condition. Solid brass with darker finish. eight inch chans with ball finials. New insulators. 1/8 IP caps. Pulls are still very strong with positive connections. These are slightly more narrow than Electrollier sockets. UNO threads. #13 Set of three Arrow pull chain sockets, Mid-century. Like new(I'm not sure these were ever used)! Eight inch chains with bell finials. Very strong pulls, positive contacts, original insulators. One has a Bryant interior, two are Arrow. Raw brass, 1/8 IP caps, UNO threads. $53.00 includes shipping lower 48.